Posted on Mon, Jan 3, 2011 : 3:12 p.m.
Publishers that have not received payments for books they shipped in recent days to Borders Group Inc. know it's in their best interests to make financial concessions to the Ann Arbor-based book store chain, an industry expert said. Borders acknowledged last week that it had stopped paying some of its suppliers for books and is seeking to restructure its vendor financing agreements. Borders is trying to restructure its vendor financing agreements. That means Borders wants some publishers to accept debt in exchange for books that have already been shipped to the retailer. In an ideal world, publishers would demand and receive cash payments immediately. But publishers have no interest in making demands that would force Borders into a more severe financial situation, said Michael Norris, a publishing industry analyst for Maryland-based Simba Information. "They probably realize that an even worse situation is for Borders to not be there at all," Norris said. "If publishers wake up in a world without retailers that are committed to the future of books, they are going to be in serious trouble." Borders has said it needs to secure new bank financing and vending agreements to avoid a cash crunch in early 2011. The trade journal Publishers Weekly is reporting this afternoon that Borders believes it has arranged new financing but that, as part of the deal, publishers would have to accept a promise for payments at a later date. The publication also said the new lender wants "a bigger financial commitment to Borders' debt service from Bennett LeBow, the retail chain’s largest shareholder" and CEO. A new vendor financing arrangement and a new source of bank financing would buy Borders some time to pursue what Borders executive Mike Edwards has called "transformation of the Borders brand." But restructuring expert Jim McTevia of Bingham Farms-based McTevia & Associates said Borders' decision to suspend some payments to vendors is an indicator of broader troubles. "I sense that the fact of the matter is the liquidity problem probably goes well beyond just a vendor issue," he told AnnArbor.com. "Extending vendor payments is usually an indication that they’re out of cash and are mashalling the cash or preserving the cash for other reasons." Borders employs about 600 workers at its Ann Arbor headquarters and about 19,000 overall. The firm's stock (NYSE: BGP) was trading at $0.92 at 2:56 p.m., up $0.02 for the day but down $0.24 since Thursday. Contact AnnArbor.com's Nathan Bomey at (734) 623-2587 or nathanbomey@annarbor.com. You can also follow him on Twitter, follow him on Tumblr and subscribe to AnnArbor.com's free newsletters. Tue, Jan 4, 2011 : 8:47 p.m. It is a sad story. I shop there whenever I can but when they seem to have a weekly coupon for 33% to 50% (or more) to get you in the door - it is not a great sign. I wish them well and hope they can weather the storm. Tue, Jan 4, 2011 : 7:16 p.m.
With all due respect to the reporter, the title states that book publishers still want Border's to survive. Really? Which publishers did the reporter speak with? I don't see any reference to an actual statement made by a publisher, let alone "publishers" as a group. This is a pretty strong statement to make without documentation or support. I know the article references one analyst using the word "probably" but go talk to a publisher, or better yet, several. I don't think you will find many that are surprised about this - they've been living with the demise for several years now, forcing them to make other plans for their own survival - with or without Borders. I don't think you'll see too many tears from publishers, imo. Tue, Jan 4, 2011 : 6:38 p.m. If ever there was a backbone to Borders, it was Tom Carney, easily one of the brightest, hardest working individuals on the management team. He suffered through enumerable management changes and course re-directions. In my estimation, he remained, not because of a lack of other more lucrative, less stressful opportunities, surely, but rather because of his commitment to the good folks of Border's and his willingness to take significant challenges head on!! Borders clearly represented a huge challenge with a lot of good people hanging in the balance! Tom was the guy they needed!! I really believed that Borders had a chance so long as Carney hung in there--so long as you had an intelligent, high quality guy like that hanging in there, seemingly there was a chance. Borders has lost their backbone--sorry, current employees, but I don't see how the company has a chance now that it has lost Tom! The good news for those that remain is that I am sure he will be supportive of Borders and will keep the reason for his departure private. Nevertheless, whatever the reason, there is no question in my mind that the fault lies with Borders and they will soon realize their mistake. He is the consummate professional. Tue, Jan 4, 2011 : 7:19 a.m.
Hmm. This could really throw a bucket of water on the whole 'buy B&amp;N' plan. Tue, Jan 4, 2011 : 12:28 a.m.
Tue, Jan 4, 2011 : 12:20 a.m.
LOL why would Best Buy be going anywhere? Mon, Jan 3, 2011 : 10:32 p.m.
@ modeltim "...Best Buy may be history as well." Any reference for that or place that is saying this is the case? Mon, Jan 3, 2011 : 9:43 p.m.
Time to stop beating this dead horse - someone puhleeeeeze finish it off! Enough! Game over. Mon, Jan 3, 2011 : 9:32 p.m.
Bricks and mortar bookstore chains are finished. Heck, it sounds like Best Buy may be history as well. Those who still have $$ to buy are using the web. Brave New World. Mon, Jan 3, 2011 : 5:36 p.m. Revolving door at the top management = a very sick company. Mon, Jan 3, 2011 : 5:27 p.m. When you are in an industry that is restructuring and wrestling with new business models, you need visionary leaders and strong managers. 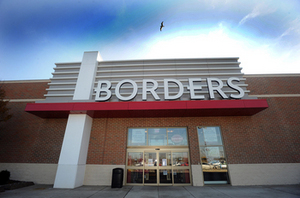 For years, Borders has had neither. Incidentally, you don't wait until you have to slow pay vendors before you arrange new financing. Is there nobody at Borders headquarters who knows even the basics of business? Mon, Jan 3, 2011 : 5:21 p.m. This is normal behavior with a dying company. Vendors are going to give them the best price and terms they can right now. I don't think it will be enough, but Borders has to find a way to cut prices in order to get people back in the door. When you know you can get a recent release for 40% less than it costs in Borders, you stop paying attention entirely. You even stop browsing. Mon, Jan 3, 2011 : 4:05 p.m.
As more details emerge, Borders' story gets couriouser and couriouser. Collateral damage to the book industry has begun. Might that compare metaphorically to the feared suction effect caused by a large sinking ship?